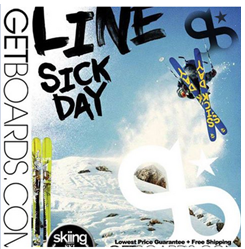 Getboards.com Ski and Snowboard Shop, rentals, repairs and online sales is geared up for the season with fresh fall and winter 2014 gear, apparel and accessories. Get Boards introduces the new Identity Series ski and completely redesigned Armada Alpha X in its Twin tip skis collection. Whether beginner, intermediate or expert, Get Boards’ online store stocks brands Line, 4frnt, Nordica, Razor, Armada and the like. Get Boards’ new 4frnt Click Twin tip skis allows for take-off and landing backward while jumping and permits skiing backwards down the slopes. The CAPITA Mid Life snowboards are designed for solid-edge control, plenty of speed and lots of pop for ollies and landings. With the seasons changing, freebords make for easy transition from skateboarding to snowboarding. Freebord’s Core Package ships with Slasher edge wheels and 72mm Upgrade centers. The Head Salamander Ski boards Snowblades with bindings comes with a free beanie and orders shipped within the US receive free shipping. Available now- start-up packages, ready-to-go boards, decks, wheels and any other components needed to build an awesome ride. The Ride Shop specializes in ski boards and snow board rentals and the equipment is tuned with complete hot wax and edge tuning before leaving the door. Finish off the experience with layering, beanies, goggles, gloves, scarfs, headphones and boot dryers. At the end of every month, guests may enter their info to win free gear and receive discounts. Check them out online @ http://www.getboards.com, call us toll free (800) 754.2627 or visit us at 40905 Big Bear Blvd. near the intersection of Big Bear Boulevard and Knickerbocker Road between the village and Snow Summit Ski Resort.